Adding a custom fire pit as part of your landscape design will enhance the enjoyment of your backyard for you and your guests by providing warmth, light, and ambiance, making them a natural gathering spot for entertaining. A fire pit also is the perfect way to extend your backyard time well into the evening, even during the spring and fall. Nothing makes a cool evening more enjoyable than sitting by a roaring outdoor patio fire pit. An evening around the fire pit, alone or with friends is a great way to rejuvenate yourself after a long day at work and getting lost in the flame of a fire can help you de-stress and unwind. A fire pit can also add a romantic element to your brick patio, gazebo or outdoor living area. There are many creative design options when it comes to the size, shape and style of a fire pit. You can have a built-in fire pit installed with a variety of outdoor finishing materials including concrete, natural stone and brick. Also, fire pits don't have to be round, they can also be square, L-shaped, triangular, or an entirely custom shape. Fire pits can range from 3’ wide to as much as 6’ or greater. Usually at a height of 12” to evenly spread heat, these are all custom-built to the owners or landscape designer’s specifications. 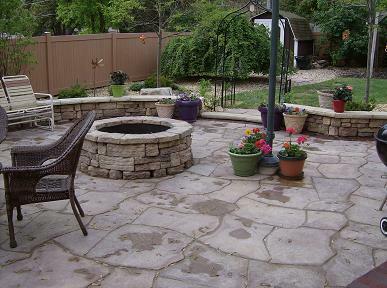 The fire pit is usually set up for burning wood but we also can set them up for natural gas. Visit the Examples Of Our Work page on this site for more creative ideas. 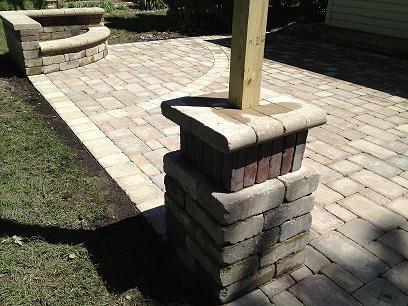 Get warm and cozy next to an unique outdoor fire pit by Suburban Landscaping. Call our design team today. In the last few years, more and more of our vendors are offering fire pit kits or packages that come either pre-assembled or ready for easy construction. These packages are usually slightly lower in price since they are pre-packaged and come with the material pre-made. Suburban Landscaping now offer these packages and kits to our clients as well as our custom designed and built fire pits. Most of the packages are a circular fire pit, metal fire ring, and cap stone, and available in a limited product line. So for a unique shape, design or for more options in materials, we would suggest a custom designed and constructed fire pit. Call one of our designers for more information on these kits and packages. 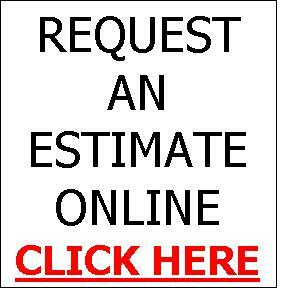 There are several variables that determine the price of a custom fire pit such as size, location, and materials used. Another factor that could also affect the price significantly would be the choice between wood burning and natural gas. We would be happy to provide you with a free consultation and estimate, or visit our pricing guide for some approximate prices.